January 30, 2019: Symphony Style Kuwait, A Radisson Collection Hotel, prominently demonstrated its culinary expertise with it’s role in the recent HORECA 2019, the largest B2B hospitality exhibition in the country, held at the Kuwait International Fair. A team of 9 culinary experts from The Exceptional joined hundreds of fellow hospitality professionals in showcasing their talents in a range of live competitions during the eighth edition of the wide-ranging event covering the hospitality, catering and food industry sectors. Hundreds of the leading chefs competed in live demonstrations and Symphony Style Kuwait, A Radisson Collection Hotel’s food and drinks experts came out on top winning many number of awards: Chef Chinthaka Sandaruwan Gamwara claimed the first gold medal in the Ice Carving category. There were more awards for Chef Chinthaka in the Fruit and Vegetable Carving contest claiming silver, and a merit certificate in the Chocolate Carving category. Chef Peran gopal reddy earned silver with his talented demonstration in the Mystery Basket category. Chef Mehmet Ali Eksim won bronze in the Fresh Pasta Competition and a Merit Certificate in the Six-course Set Dinner Menu category. Chef Nalin Chathuranga balasarigo was a silver medalist in both the Cold/Hot sandwich and the Six-course Set Dinner Menu categories. The Exceptional was bronze in Sushi as chef Dhanusha Tharaka demonstrated his expertise in the category. 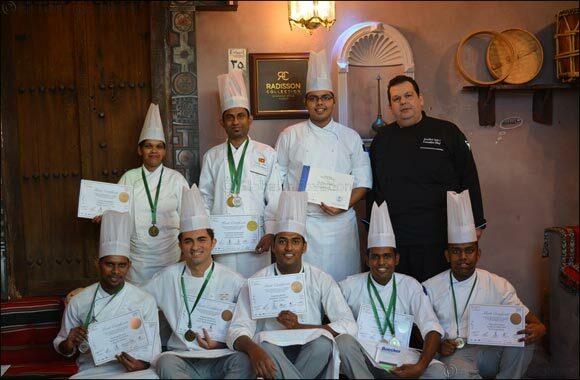 Bronze medals were also won in the Asian Cuisine, and the Kuwaiti Traditional Dish categories. Lastly, chef Nalaka earned a merit certificate in the Best Burger Challenge. “Symphony Style Kuwait seeks to always demonstrate its team’s talent and experience through supporting events and promoting local culture; This was one of the best opportunities to do so.” Expressed General Manager, Peter Schuler in support of the winners and the exhibition. Symphony Style Kuwait, A Radisson Collection Hotel’s prominent participation in HORECA 2019 cements its reputation as a hospitality leader in the region and highlights its commitment to supporting events that promote local culture and Kuwait as a business and leisure destination.